ONE OF THE OLDEST CITIES IN AMERICA & THE SCENE OF SEVERAL KEY EVENTS SUCH AS THE AMERICAN REVOLUTION AND THE BOSTON TEA PARTY. WHETHER YOU'RE INTO HISTORY, ARTS, CULTURE OR EDUCATION, BOSTON HAS SOMETHING FOR EVERYONE. View pricing and purchase tickets online from top tour company Trusted Tours & Attractions! You'll find guided bus tours, as well as admission tickets to the Plimoth Plantation and Salem Witch Museum. See the best of Boston with the Old Town Trolley Tour! From Beacon Hill to the New England Aquarium, the Back Bay to Boston Common. Hop on and Hop off at any of the 19 designated stops. 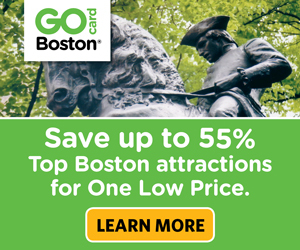 An exciting 90 minute fully narrated trolley tour of Boston with an 18th century costumed guide. Tour also includes Hop On Hop Off privileges all day, FREE admission to the Old State House PLUS a 45 minute harbor cruise. This package includes the best of Boston on land with Old Town Trolley Tours plus FREE admission to the Old State House and the best sights at sea on a whale watching tour. Package components can be used on separate days. Plimoth Plantation is Plimoth as it was in the 17th century. It is a centuries old Wampanoag homesite with townspeople speaking the poetic language of Shakespeare's England. Climb aboard the Mayflower II, visit the Plimoth Grist Mill and talk with living history g history educators. The Salem Witch Museum takes you back to the inexplicable events that unfolded in a tranquil seaside community. Experience the hysteria that gripped Salem in 1692 through fascinating narratives, dramatic lighting and exhibits depicting the Witch Trials. Leave your 21st century troubles behind and grab a mug of ale, sample rustic fare and join the sons & daughters of Liberty for the best hospitality in all of 18th century Boston. Play authentic games and learn boisterous songs. See the full menu on the booking page. The Boston skyline and several iconic landmarks provide a spectacular backdrop for a delicious buffet lunch during a two hour scenic harbor cruise. While you dine you can listen to a fascinating narration about the city & many sights. The Spirit of Boston offers a refreshing sunset cruise around Boston's historic harbor. Its an exciting voyage that's sure to make any vacation plan or celebration unforgettable! Includes sunset dinner buffet and entertaining DJ and dancing. Travel in style with BHC aboard the Nathaniel Bowditch. This vessel is the only high speed ferry operating between Salem and Boston allowing you to get there quicker and make the most of your time whether it be for one day or one week.